Have you been loving all the inspiration so far from this blog tour? 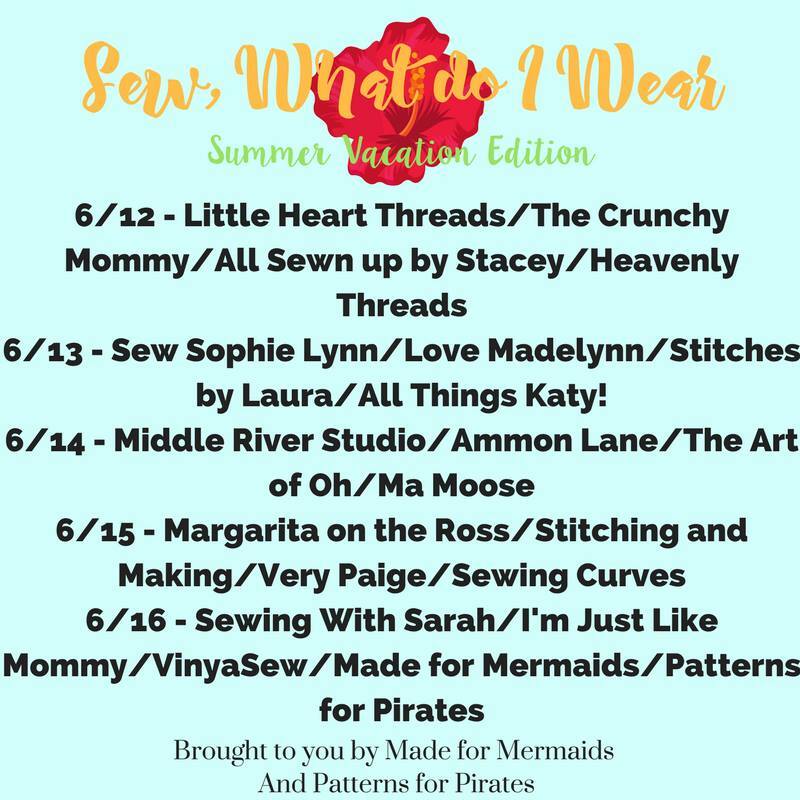 If you're just popping in and this is the first post you've seen, you should definitely check out the other bloggers and see how they style their patterns from Made for Mermaids and Pirates for Pirates for their vacation (or staycation) needs. As for me, I'll about versatility, comfort, practicality and style. Whether on Vacation or on the daily, I have kids so a lot of my daily activities are the same wether I'm in Mexico, the mountains, or at home. So, Mama Daphne and Timeless Tunic to the rescue! Mama Daphne was a pattern I had been on the fence about for ages. One, because I don't wear off the shoulder, and two, it was a little shapeless for me. 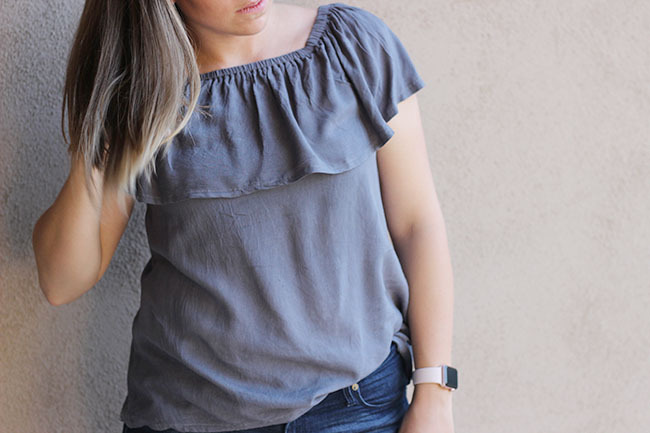 Both of those factors may sound hilarious since off-the-shoulder and shapeless are 100000% on trend right now. But they don't work for me. But I kept coming back to it because I liked the ruffle, the feminine flair and light air look of it. So I decide to use it as a base to create the perfect top. I used rayon challis from Fabrics Wholesale Direct on eBay (only $4 a yard!) and then made some changes to the pattern to get this fit. I actually didn't change very much but it kind of sounds like a lot. Its not, I promise, and it was incredibly easy, in case you want to recreate this look. +I added 3 inches in length: I wanted it to be longer, plus I am 5'8"
+Reduced the width of the ruffle for 4 inches: Since I planned on wearing it only on my shoulders and never off of them, I shortened the elastic so that it would naturally want to sit in closer on my shoulders. +Added shaping to the side seams: I am pear and tops without waist shaping just don't look good on me. These were super easy alterations to make as I was cutting it out. I also finished it in french seams because that is my personal preference when working with lightweight wovens. Now I have a top I love, that gets worn often and is a perfect practical top for Arizonas 117/46 degree temps this week. I love dresses because they look put together but are only one garment. To me they mean no-fuss yet put-together. I love that I can still look good, chase kids, run errands, go out with girl friends, head the beach, hit up the snack shack, head to an outdoor movie, and hustle kids from the car, airport, and all activities in-between in just one garment. Which means no adjusting of the clothes. No pulling up your pants, pulling down your top - or up - as the case may be, tucking something in, etc., etc. Timeless Tunic/dress is perfect because you can make it in a variety of fabrics to get the look you're going for. 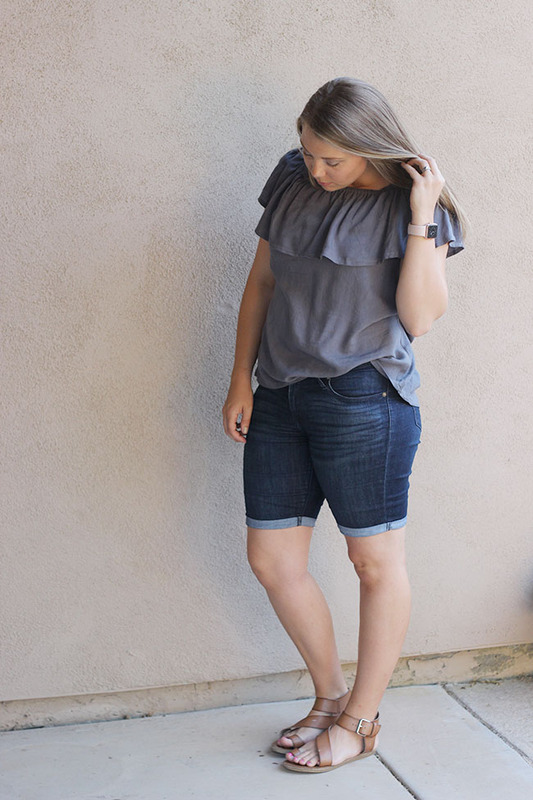 Wear with wedges, sandals, casual tennies (like my go-to pink vans) and basically have an outfit for any occasion. For my dress I added several inches (4, I think, can't remember exactly, also I'm 5'8" for reference) to make it hit around the knee. I also finished the neck with bias tape because me and facings don't get along. I also finished it with french seams to give it a clean finish. 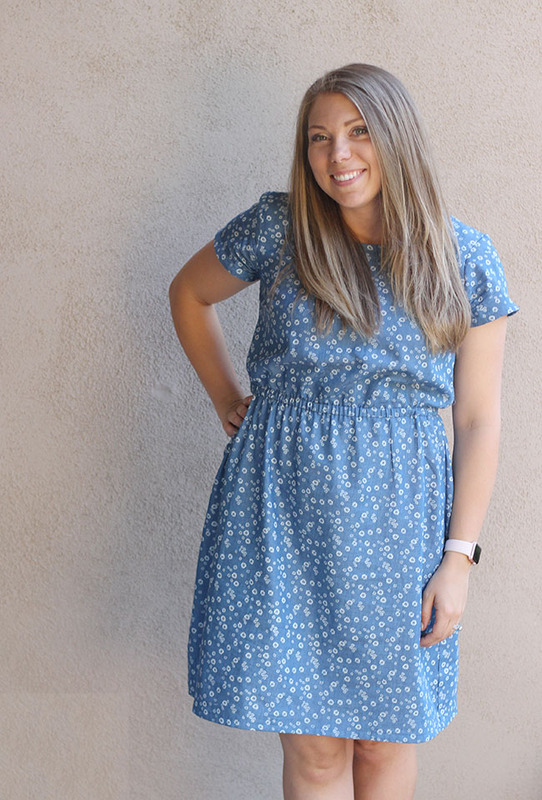 I used this daisy chambray from Raspberry Creek Fabrics (its still in stock!!) - and bonus! Back in this post I said I planned to make this dress out of this fabric so I feel accomplish that I actually did it! I hope you feel inspired for ways to make M4M and P4P patterns work in for all your summer vacation needs, and check out the other bloggers who have created mini capsules, swim wear, and so much more! 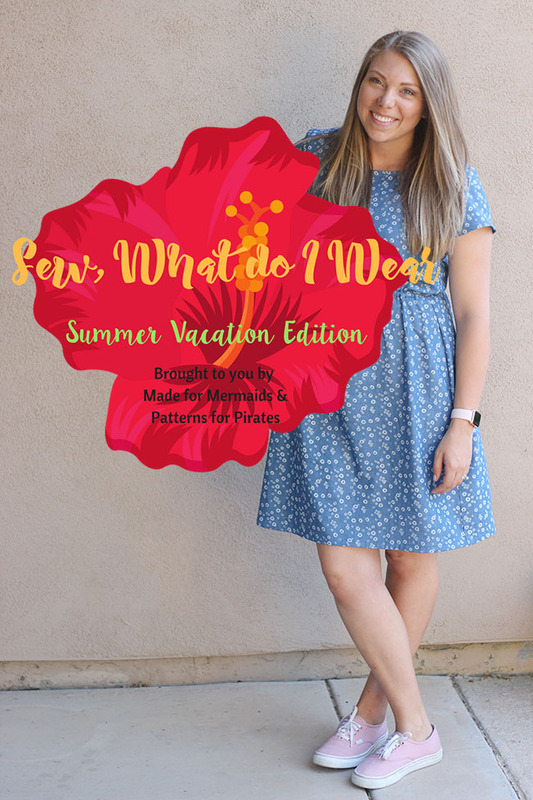 Where are you going on vacation this Summer and what patterns are making their way with you??? I'm not sure what your training is for sewing, but you always sound so professional/"she knows what she's talking about"
I have had the Timeless Tunic pattern since it came out and I still haven't made it! Thanks for the inspiration -- I love how yours turned out!